I’m feeling a little under the weather today. I haven’t been sick in such a long time (thank you immune system! ), but finally I’ve come down with a bit of a bug. I luckily had the day off of work but felt like being snuggled under the covers all day. I had to leave the house to run some errands and go to the pharmacy but didn’t want to leave the house completely bare-faced because if I’m really tired, my under-eye circles could probably scare the boogie man! (And by the way, this look may not be for everyone because if you’re one of those girls that can leave the house without any makeup on looking downright flawless, I envy you, girl!). Since I just couldn’t be bothered to put on a full face of makeup I headed for my go-to “No Makeup” Makeup Look! I figured today would be a great time to share the products I use to achieve this look! This look is great for when you want to get ready in less than 5 minutes and still look presentable. This is my go to look for a day of running errands or if you like to keep it low key, it’s a great easy everyday makeup look. I’ve worn these products camping (okay, glamping :P), heading to the beach, on lazy Sundays, running errands, whenever I’m in a rush, or for a fresh faced youthful look! 1. Moisturize. I have been loving Origins Vitazing moisturizer with SPF 15. When you first dispense the product it looks white with almost a grainy look to it, but as soon as you start blending it in, it starts to develop a little bit of a color. It almost acts as a very light coverage tinted moisturizer. I would be careful if you have oily skin. Since I have normal/dry skin, this product works great for me. The Origins Ginzing under eye cream has been great for daytime use. It has almost a sheen to it and this works for me since my under-eye area can get very dry and crepe-y. It’s supposed to reduce puffiness as well, and I’m not sure I can attest to that, but it does the job of moisturizing the under eye area. 2. Conceal. Spot conceal any dark spots, acne scars, or problem areas you have. Many of us have redness around the nose, so that’s a good area to dab a little concealer if you’re not planning on wearing any liquid foundation. I have been absolutely loving the Urban Decay Naked Concealer. It’s creamy, pigmented, does not settle into my fine lines, and the applicator makes it very easy to work with. Not all concealers can be used for both the face and under eye area, but this one definitely can. If you’re dealing with any blemishes, I love the CoverFx Blemish Treatment Concealer. It has 1% salicylic acid in it to treat blemishes while concealing. It blends like a dream and has great coverage for those spots. Don’t forget to blend, blend, blend! I just use my fingers to gently dab in and blend the concealer. 3. Set. This Hello Flawless Powder by Benefit is AMAZING. I have been using it for years now to set my foundation or even for a little extra coverage on lighter makeup days like this. It has a natural satin finish which isn’t too dry or powdery on my dry skin. It literally does make your skin look flawless and the powder is so smooth and finely milled. I recommend using a big round fluffy brush to apply. 4. Brighten. A good blush can really wake up your face and bring it back to life. I have been using the Becca Mineral Blush in Flowerchild, which is a peachy pink blush with golden highlights. Dust your blush of choice onto the apples of your cheek and slightly upward in a straight line up to your ear. This will make your cheekbones pop. 5. Shape and Set. Use light strokes to fill in your brows with a brow pencil or for a more natural look, you can use an eyebrow powder or matte eye shadow with an angled brush to fill in your brows. A good rule of thumb for those of us with dark hair is to choose a color a couple shades lighter than your hair to give the most natural effect. And for those who have blonde hair, go a couple shades darker. An optional step is to set your brows with a brow gel/mascara to keep them in place. I have been using the L’oreal Brow Stylist Plumper Brow Gel Mascara in the color Light/Medium. It also comes in the shades Transparent and Medium/Dark. Since I’ve lightened my hair with my ombre/balayage highlights, I’ve actually been liking using the light medium color because it gives my brows an overall lighter appearance. 6. Accentuate. Curl those lashes and put on a couple coats of mascara to really bring out your lashes and wake up your eyes. Since I have straight Asian lashes, 99% of the time, you’ll find me using waterproof mascara since it tends to hold my curl much better. I was recommended to try the Maybelline Lash Sensational Mascara by my girlfriend Josephine and I have been loving it. Thanks Jo! Sometimes, if I have even less than 5 minutes, I’ll only use steps 1, 2, and 6 before I head out the door. Thanks for reading and let me know if you have any recommendations or what you like to use for your “No Makeup” Makeup Looks! Here are the beauty items I was reaching for all month in February. 1. Urban Decay Naked Basics Palette: This is a great neutral palette for every day looks that can be used on its own or to compliment almost any shadows or palettes you have. The color Naked 2 (third from the left) is one of my favorite blending colors for any look. Just make sure you don’t drop your palette, because mine is now missing the black color… oops! 2. Physicians Formula Youthful Wear Spotless Foundation: I picked this up when CVS was having 40% off all of their Physicians Formula products. After purchasing it, I have worn it almost every day in February. It’s less viscous/more liquidy than most foundations I’ve ever used so I can understand how that may be off-putting for some people but it still offers a medium coverage that is buildable. The benefit of this is, it looks as if you’re not wearing foundation at all because it’s so lightweight. I was drawn to this particular product because it claims to be a foundation and a skin care serum that reduces the appearance of spots by 67%. I have noticed that some of my spots from recent blemishes have faded faster than usual, but there is a chance I’m just paying more attention to that now. If anyone would like, I can do a full review on this product. 3. L’oreal Telescopic Shocking Extensions in Blackest Black Waterproof: In the past, I have been a fan of layering mascaras but sometimes I just can’t be bothered with that. I love this mascara especially in the waterproof formula because it makes my lashes look long, separated, and holds curl like no other. I would say this mascara offers more lengthening than volumizing, so on a daily basis without any need for layering, it’s a great pick. Just a warning, for those of you who don’t like the feeling of hard lashes while you’re wearing this mascara, this one WILL give you that feeling. I don’t particularly mind that feeling so I will be staying loyal to this mascara. 4. NYX Cosmetics HD concealer in Medium: This is a great creamy concealer with medium to full coverage that’s great for the under-eye area. I think it’s a great dupe for the Nars Radiant Creamy Concealer which I own, but don’t necessarily find myself reaching for that often. So if you’ve been wanting to try the Nars concealer but are unsure if you want to splurge, give this one a try! 5. Nars Larger than Life Long-Wear Eyeliner in Via Veneto: I can’t say enough good things about this eyeliner. The formulation is creamy and smooth but does not budge. Although I have dry skin, I have quite oily lids, and even with a good eyelid primer, I would find that almost every pencil eyeliner would transfer above my crease on the upper eyelid. This eyeliner does NOT transfer or smudge on me. The application is nice and smooth because of the creamy consistency so you won’t feel tugging on your eyelid and I personally find pencil eyeliners are the easiest to apply. This particular color (Via Veneto) is one of the blackest blacks you will find so this is great for smoky eyes. P.s. If anyone has been wondering where my Project 365 posts have gone and if I’ve still been doing them, I have! I just decided to move them to a different location to keep Inspire Me, Mon Ami dedicated mostly to fashion and beauty. If you’d like to still see my Project 365 posts, either comment below, or let me know at inspirememonami@gmail.com, and I’d be happy to share them. I wasn’t allowed to wear any makeup until I turned 16 and being a girly girl that was pretty much torture to me. So, as soon as I was allowed to explore the world of beauty products, I was in trouble. To me, makeup really is art, and I love how expressive you can be with it. I definitely went through a phase of wearing blue lipstick and putting glow in the dark stars at the outer corner of my eyes because I thought it was cute… I’d like to think I’ve come a long way from that. I have and think I always will be the type of girl that thrives on finding a good bargain, so drugstore makeup has a special place in my heart. Don’t get me wrong, I frequent Sephora so often and own so many of their products that my friends think I should start getting a commission from them. Whenever us girls go into Sephora they feel like they can rely on me to tell them every make up and beauty product they need in their artillery. What I have learned from my many years of make up loving and experimenting is that the drug store makes AMAZING cosmetics, too! These are 10 products that can complete an every day flawless face in minutes. I’ve listed the products in order of how I apply them. 1. L’oreal True Match Lumi Healthy Luminous Makeup: I am obsessed with this foundation because I have dry skin especially in the winter. This foundation offers medium coverage with a dewy finish that makes you look like you’re glowing. There is a wide range of colors allowing you to pick from warm undertones to cool to neutral undertones. The packaging is also amazing for drugstore makeup because the bottle offers a pump for easy dispensing without the mess. 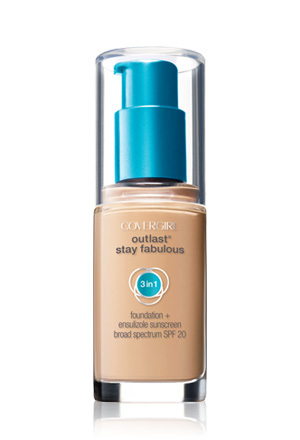 This foundation also has SPF20. I wear the color W6 Sun Beige. Covergirl Outlast Stay Fabulous 3-in-1 Foundation: I won’t do a full review on this at the moment but this is a great alternative for someone with normal to oily skin and also contains SPF 20. Revlon Colorstay Whipped Creme Makeup: This foundation is also for normal to oily skin and the name of this foundation does not lie. It really does stay put all day. This foundation is very full coverage so I wouldn’t recommend wearing this everyday unless you like the extra coverage. I prefer this for going out at night or when I plan to be in photographs. This does not contain any SPF so you don’t have to worry about any ghostly white cast from the flashback in photos. 2. Maybelline Instant Age Rewind Eraser Dark Circle Treatment Concealer: This under eye concealer comes in a neutralizer shade (yellow), brightener shade (light pink), and the usual range of light to dark shades. I love this concealer because it is lightweight, therefore not settling into fine lines, but offers good coverage. I wear the shade medium, but if I’m not as well rested and my dark circles are more prominent, sometimes I will wear the neutralizer shade under the medium shade. 3. Maybelline Fit Me Shine-Free Foundation Stick: I actually use this foundation stick as a contouring stick at the moment. I bought this foundation in the summer because I was curious about it and am always trying to shave off any time in the morning when I’m getting ready so I thought a foundation stick would do that. Since the shade 330 Toffee Caramel is too dark for me at the moment, I use this as a contour stick and pop it under my cheekbones, along my jawline, and around the the outside of my forehead for extra definition. I am a strong believer in contouring and this is a step I don’t skip. The bonus of using a foundation stick as a contouring stick is that it blends like a dream. Try it out and tell me what you think! 4. Milani Baked Blush in Luminoso: I absolutely love this blush. It’s formulation is baked so it goes on effortlessly without having to do very much blending and it gives you a nice subtle glow. I like to use this color year round for an effortless every day look. 5. Maybelline Color Tattoo Cream Gel Eyeshadow in Bad to the Bronze: This eyeshadow and this color in particular is amazing because it is so easy to use and makes it look like you put a lot of time into your eyeshadow with very little effort at all. Swirl your ring finger in the pot a couple times then blend onto your lid using windshield wiper motions slowly blending upwards. This creates a blended almost smokey look in one step. This dries quickly which makes it stay put all day so make sure to work quickly. 6. Rimmel London Professional Eyebrow Pencil in Hazel: I didn’t discover the power of good brows until 4 years ago. I definitely went through that Christina Aguilera phase where I had pencil thin brows against the advice of my mom. Whoops! Your brows really frame your face and can make you look so much more finished. Brows are intimidating to work with at first so I like this pencil because the brush at the end helps blend everything in and make it look less harsh. 7. Maybelline Master Smoky by Eye Studio in Black Smoke: For my every day makeup, I prefer a soft eyeliner look as opposed to a more precise defined liquid liner look. This is just my personal preference. I like this pencil because it’s very forgiving and gives a great smudged out effect and it stays put all day. I generally have problems with many eyeliners transferring on my upper lid throughout the day but this one works great for me. 8. Eyelash Curler: Okay, so this one isn’t actually drugstore but I am so loyal to my Shiseido eyelash curler and haven’t found a drugstore alternative that keeps my straight Asian lashes curled all day yet. Do you know of any? Curling your lashes can really open up your eyes and make them pop while giving you a more feminine look. 9. Maybelline The Falsies Flared Volum’ Express Mascara in Very Black Waterproof: Wow, that is a long name… but I swear by this mascara. To me, it MUST be the flared version in the waterproof formula. There is something about this brush design that really does flare out my lashes at the end that gives a beautiful effect. And like I mentioned earlier, I have stubborn straight lashes so waterproof mascaras are the only ones that can hold my curl. Waterproof mascaras tend to be on the dryer side, therefore not weighing down lashes with a wet formula. 10. Revlon Colorburst Lip Gloss in Crystal Lilac: I own more lip products than any girl would ever need so I have tried my fair share of them. These lip glosses stand out to me because they are pigmented and don’t require you to wear a lipstick underneath as many lip glosses do. What you see in the tube is the color pay off you actually get. I also enjoy the scent and the formulation isn’t too sticky. My favorite daytime colors are Crystal Lilac and Bellini. To quickly change this to a sexier nighttime look, try this gloss in the color Bordeaux and you are set! I hope this was helpful! Please subscribe and let me know if you’d like to see more posts like this! If you'd like to follow my adventures and get notified when I post, sign up here! Since winter seems go be hanging on for dear life 😜 we decided to take advantage of it and head up to Cypress mountain for one last shred of the season. 🏂 I still have a long way to go but I definitely learned a lot this season! The bod is hurting today. I can't believe it was snowing at the base of the mountain and on the slopes all day yesterday while we were there.. In April!! This shot was taken a few weeks ago on a little plane that connected me from Edmonton to Vancouver. The views were breathtaking! 💆🏻 Reminiscing about our relaxing Whistler weekend up at Nita Lake Lodge over my birthday weekend as I go to bed early on a Friday night. Gotta get enough rest for another work day tomorrow. #grindlife #workworkworkwork I am forcing a real day off in there on Sunday! Happy weekend y'all!